Adoption center cleaning (litter boxes, adoption rooms, laundry, etc.). Preparing condos for adoption events. Preparing newsletters and pamphlets for distribution. Stocking retail shelves and pricing merchandise. Sorting food for foster homes, adoption packets, and public handouts. Fostering animals with their family. Volunteering with animals is fun, but there is real work to do! 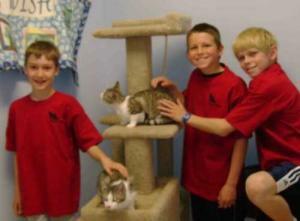 Most kids work at weekend adoption events with our cats available for adoption. If you don’t want to clean litter boxes, help clean cages, sweep floors, do laundry, or any of the other work that helps keep our pets healthy and comfortable, then volunteering with us isn’t for you. Our cats and kittens are socialized during the week with their foster homes and we limit volunteer contact with our cats to minimize the risk of spreading disease. How often do kids work? Sign up to work 2 hour shifts at adoption and other special events on days that work into your family’s schedule. I’d like to have our whole family involved. Is that possible? Of course! Many families work together to help Angel’s Wish. Some work together to provide a temporary home for Angel’s Wish’ animals while they are waiting to be adopted. Others take the Youth Volunteer Basic training together, whether they plan to volunteer regularly or not. It’s a great source of information about basic animal care for all ages. But I’m Just a Kid…How can I help animals? There are more animals needing adoption than there are homes. Kids can make a big difference! Not sure what to do? Here are some ways you and your friends can help homeless animals. Make your next report or presentation for your class about the pet overpopulation problem, responsible pet care, spaying/neutering, or animal abuse. Ask your teacher if your class can do a letter-writing project about animal-related topics. Write letters to your local and state government officials and the newspapers. Make a bulletin board and display responses so other students can see them. Volunteer to help younger students with their reading. Help them read stories about people helping animals. Teenagers can visit HumaneTeen for ideas about teaching younger kids about animals. Start an animal club at your school! Make a bulletin board about overpopulation, spay/neuter, adoption, or other pet care topic. Tell your teacher about KIND News, a classroom newsletter for kids kindergarten through 6th grade. Ask your librarian to select books about animals to be displayed during Be Kind to Animals Week. It’s always the first full week in May. Arrange for speakers to come to your school. Ask animal professionals to speak to your class, youth group, or school about their work. Some possible speakers include humane educators, animal control officers, veterinarians, zoo educators, or wildlife rehabilitators. Have a penny war, hold a bake sale, car wash, yard sale, or other fundraiser to benefit homeless animals. Collect used cell phones and printer cartridges…Angel’s Wish can recycle them and get money to help animals. Start a donation drive for supplies…food, toys and whatever else your local animal organization needs. Do you know an elderly person? Someone sick who has a pet? Volunteer to help feed, walk or bathe their dog, or change kitty litter. Your help may allow them to keep their pet rather than have to find it new home. If you feel strongly about an issue or event affecting animals, write a letter to the newspaper expressing your views. Kid’s views are important! Your words can make adults think and act! Make posters for the neighborhood about taking care of animals, spaying and neutering, adopting older animals, and everything that is involved in taking care of a pet. Angel’s Wish has posters ready if you want to hang some. Ask permission to put them up in stores, veterinarians’ offices, or on community bulletin boards. If you know somebody who wants a pet, tell them about adopting from a shelter or rescue. Even people in other areas can check on Petfinder.com for animals in their area. Having a birthday party? Ask your friends and family to bring a present for a homeless animal instead of for you. Save a penny a day and donate the money to help homeless animals when you fill your container. Be a responsible pet owner. Keep current identification on your dog or cat at all times. Spay or neuter your pet. Keep your dog or cat properly confined or supervised. Give your pets the basics–food, water, shelter, veterinary care and lots of love. Save a life. Adopt your next pet from an animal shelter or rescue. Learn more about animals. There are some great books at your local library!